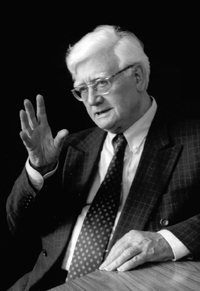 23 December 2009, after a short illness, theologian Edward Schillebeeckx has died in Nijmegen, where he lived. He was 95 years of age. Theologian Edward Schillebeeckx (born in Antwerp in 1914), advisor to the Dutch bishops at the Second Vatican Council in Rome (1962-1965) and at the Dutch Pastoral Council at Noordwijkerhout (1966-1970), played a major role in ecclesiastic and theological renewal in the second half of the Twentiest Century. With his academic studies and pastoral books, he inspired a large reading public, both within and outside the Christian churches. His erudition and eminent knowledge of the Christian tradition went hand in hand with a strong commitment to Church and society. His theology was focused on human beings in the creation of a pre-eminently humane God, whose object is human salvation: Deus humanissimus. Back in the 1950s and 1960s, confronted by these questions, Schillebeeckx wrote such influential works as Sacramentele heilseconomie (‘The Sacramental Economy of Salvation’, 1952, not published in English), Christus sacrament van de Godsontmoeting (‘Christ the Sacrament of the Encounter with God’, 1959) and Het huwelijk (‘Marriage’, 1960, not published in English). Many recognized him as a major innovator in the fields of theology and religious experience. Because of this, Cardinal Alfrink asked him to act as advisor at the Second Vatican Council. His concern for people prompted him to take on the flood of critical questions that was unleashed by this Second Vatican Council. He consistently stressed that God is not directly accessible as a separate being and that human beings have to take responsibility for their own history, a responsibility that they must face up to in solidarity with others, especially the poor in their midst. This is a matter of human faith in God, for ‘in your own footprints you will discern the imprint of God’s love’. That is how we become aware of God, not directly but always in a mediated way. 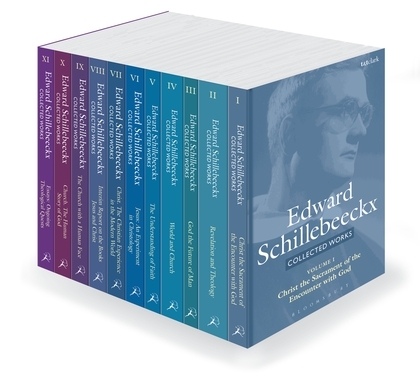 In the 1970s and 1980s Schillebeeckx published his major works: Jezus, het verhaal van een levende (‘Jesus: An Experiment in Christology’, 1974), Gerechtigheid en liefde, genade en bevrijding (‘Christ: the Christian Experience in the Modern World’, 1977) and Mensen als verhaal van God (‘Church: the Human Story of God’, 1989), and other treatises on the church’s official ministry, politics and democracy, pastoral volumes and articles. These works were born of his studies of, and participation in, vital movements in the church and the world at large, including those towards a growing autonomy in faith and ethics, towards democratization, the engagement of Christians in politics and of women in the church, liberation theologies and base communities. He is also known for his critical identification and repudiation of all manner of ideologization, which either legitimizes established positions or obstructs new ones. In the nineties, after he had finished Mensen als verhaal van God (‘Church: the Human Story of God’), Schillebeeckx led a rather retired life. Theologically speaking, however, he remained quite active, and turned once again to the subject of his first major work: religious rituals and the Christian sacraments. On the one hand, he wanted to take into account the developments in cultural anthropology and what is known as ‘ritual studies’, while, on the other hand, he tried to incorporate the theological insights that he had acquired since the seventies into the experience of and reflection on Christian liturgy. He was not able to finish the book he had planned to write on these issues. As a theologian Schillebeeckx operated at the interface between what is handed down to us from the past and the contemporary world. Many see him as pioneering a fresh understanding of faith, in which mission is acquiring a new character marked by a greater appreciation of the distinctive properties of Christianity as well as other religions. For, according to Schillebeeckx, God’s truth is so abundant that no single religion can interpret him fully, nor can our knowledge of God be grasped by the best of all religions put together. For God is new each moment and greater than all religions combined. Born in Antwerp, Belgium, on 12 November 1914. Secondary education: Jesuit school at Turnhout. Studies: Philosophy at Ghent (3 years) , Theology at Louvain (4 years) and the Sorbonne, École des Hautes Études and Collège de France in Paris (1 year; with Marie-Dominique Chenu and Yves Congar, among others). 1952: Doctorate at the Dominican faculty of Le Saulchoir, Paris. 1943-1958: Lecturer in Dogmatic Theology and spiritual guide of the Dominicans at Louvain. 1958-1983: Chair of Dogmatic and Historical Theology at Nijmegen, The Netherlands. Advisor to the Dutch bishops at the Second Vatican Council (1962-1965) and the Pastoral Council in Noordwijkerhout, The Netherlands (1966-1970). During his life, he was awarded seven honorary doctorates and, in 1982, he received the Erasmus Prize. • Christus sacrament van de Godsontmoeting (‘Christ the Sacrament of the Encounter with God’), Bilthoven: Nelissen, 1959. A complete bibliography (also of the books about Schillebeeckx) can be found elsewhere on this website.